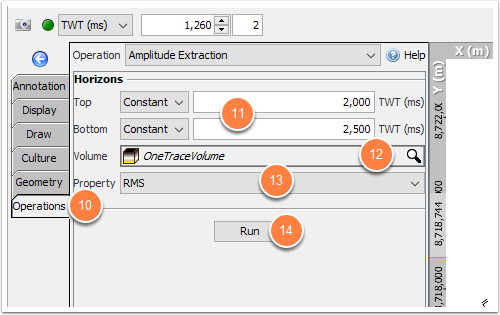 DUG Insight User ManualFrequently Asked QuestionsFrequently Asked Questions SyntheticsHow do I find the RMS amplitude for a single trace over a given time window? How do I do this with a synthetic? Go to the Process tab and create a new Probe. Type a name for this probe e.g. "OneTraceProbe". Set the IL/CL size manually in the details panel. Use the same value for min and max for each extent. While still in the Process tab, create a Volume Sculpting process and type a name for it e.g. "OneTraceVolume". Select your volume in the Input Volume text box. Select the earlier created probe (e.g. 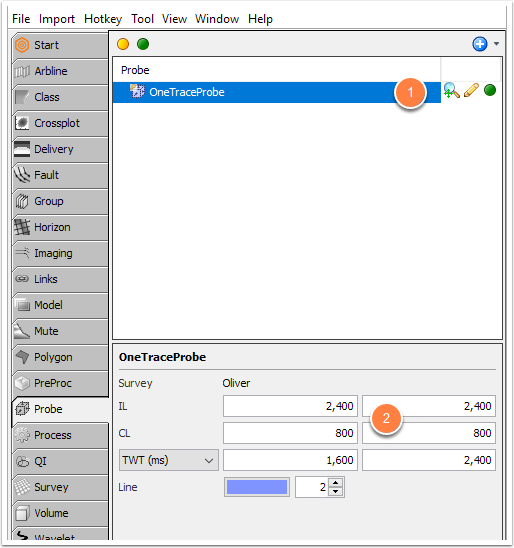 "OneTraceProbe") for the Constrain to area option and choose Based on Survey location. 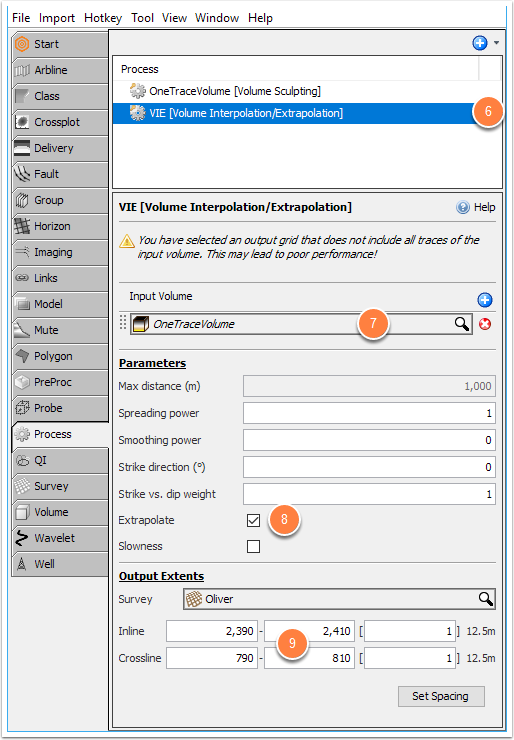 Next, create a Volume Interpolation/Extrapolation process. Select the Input Volume as the one created from the Volume Sculpting process e.g. "OneTraceVolume". For Extents, select a small arbitrary area around the probe, approximately 20 x 20 traces. In the Map View, click the Operations tab on the right and select Amplitude Extraction in the Operations dropdrop box. 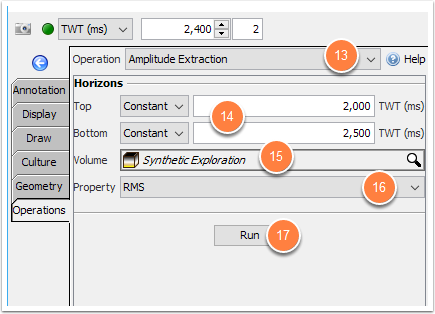 Set the interval to analyse by entering a top and base (constant) time, or by choosing horizons. Choose your created volume from the Volume Sculpting process e.g. 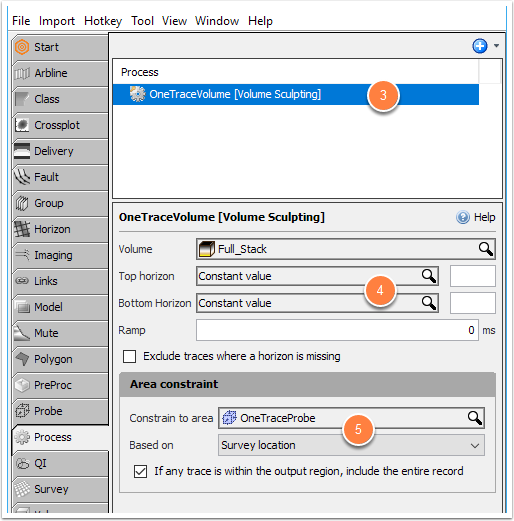 "OneTraceVolume" for the Volume option. Set the class to "RMS" and click the "Create New" button. The map view will return a single result for the extrapolated area containing the RMS (or other property) for the single trace. Go to Tool > Synthetics to configure the well in the Synthetics window. Click the Well tab and select the input well curves for the synthetic: P Slowness, S Slowness and Density. 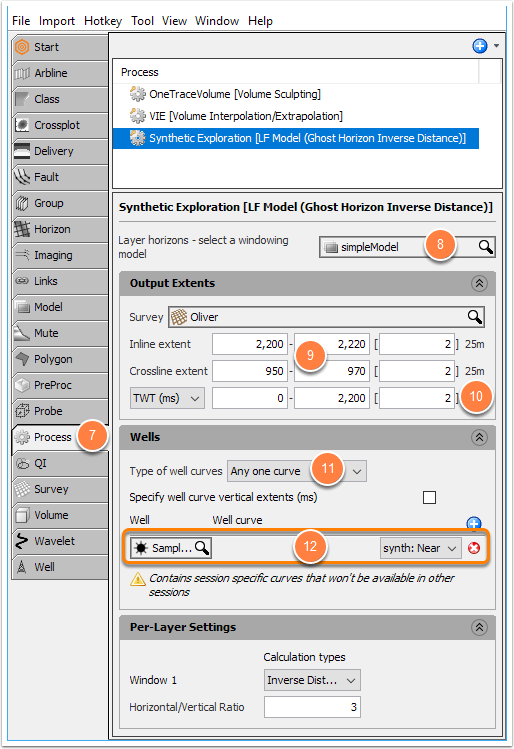 Select the Angle, Wavelet, and Stack parameters in the Synthetics tab. Confirm that a synthetic is generated! Go to the Model tab and create a new arbitrary window Model. Type a name for the model e.g. "simpleModel". 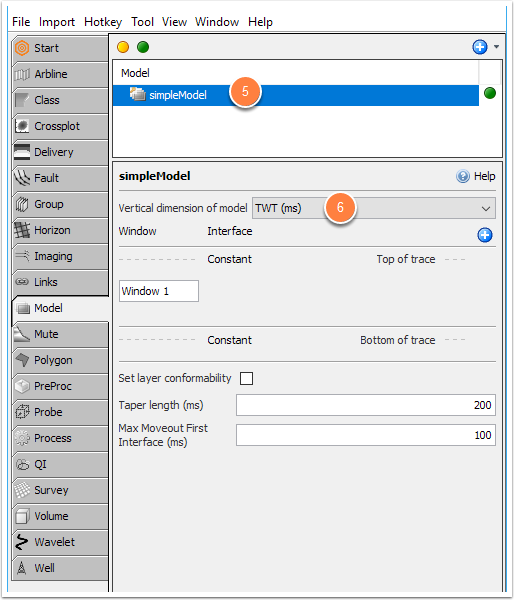 Select TWT domain for the Vertical dimension of model setting. It does not require any windows or layers. Go to the Process tab and create an LF Model (Ghost Horizon...) process. Name the process e.g. "Synthetic Extrapolation". Select the earlier created Model as the Layer horizons e.g. "simpleModel". In Output Extents, pick a small arbitrary area around the well, approximately 20x20 traces. Set the TWT sampling to 2 or 4ms (match the rate of the seismic). 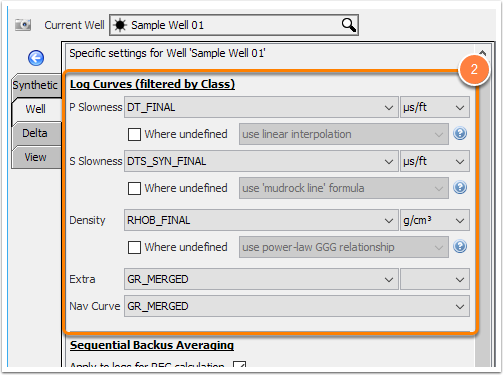 Select Type of well curves as "Any one curve". Select the well and the "synth: (near)" synthetic trace - If the trace isn't listed, confirm that the synthetics are configured correctly (from step 1). Choose your created volume from the LF Model process e.g. "Synthetic Extrapolation" for the Volume option. Prev: How do I scale synthetic trace relative to seismic? Next: Why does the amplitude spectrum not show deeper peaks and troughs as expected?